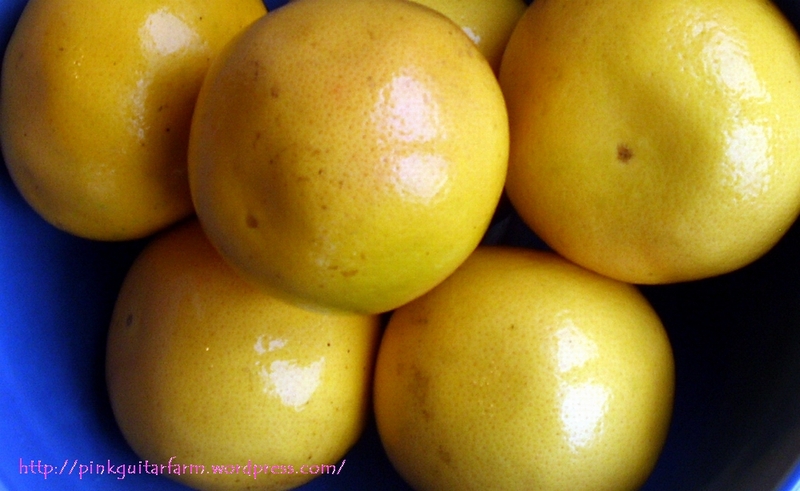 Until I have my own orangery (chances, slim to none) I’ll have to buy Florida citrus or hope my friends and former neighbors in zone 9 out west continue to take pity on my decided lack of bright yellow and orange food hues during the winter season here in Tennessee, where I am trying to eat local. A few weeks ago I ordered 40 pounds of red navels and 40 pounds of ruby red grapefruit from a local food coop that has citrus shipped in from Florida in January. I suppose when you’re going to cheat on the eat local thing, make it count. I’m a little late getting in on the whole canning/preserving lovefest. I tried this summer but had so much fresh produce to grow, harvest and sell (much of it to canners, no less) that I didn’t get a chance to put up much for myself. Looking at canning recipes for citrus I found a gorgeous marmalade, Christmas Marmalade in the Putting Up book by Stephen Palmer Dowdney which I will try, but it calls for more sugar than I had on hand. I am trying to cut down on sugar and since I couldn’t help but want to preserve these gorgeous fruits and hold on to the vibrant colors – RIGHT NOW, I continued my search. The description for Sliced Orange Pickles in The Joy of Pickling book, by Linda Ziedrich (pg. 243) goes like this: “chewy, sweet, tart and slightly bitter”. Assuming tart means sour, we’ve hit 3 of the 4 types of taste buds in one go. I like that for some reason, it seems thrifty, plus the recipe only called for 4 cups of sugar, so I went with it. Since I’m new to canning, I didn’t trust my canning/sterilization methods with the first batch (confidence issue) and I thought the slices were too large to snack on (rationalization). The instructions called for slicing the segments rind and all, but they didn’t come out clean so I had a lot of pulp in my syrup. I don’t care about the pulp, but wanted smaller slices and to ensure sterilization. 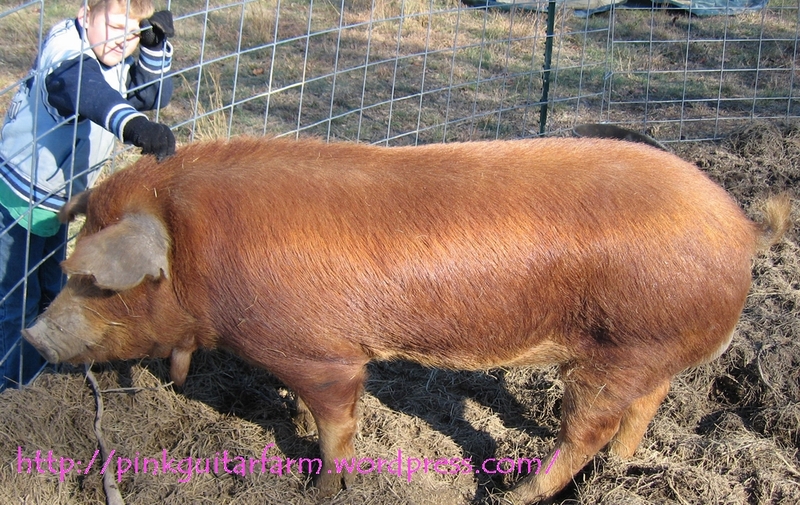 Instead of putting that fist batch in the cupboard, I gave it to Wally, our Red Wattle boar. Pigs don’t typically like the rind of citrus but in this case, he ate it ALL. Speaking of feeding pigs, although they eat grass from pasture or nuts, plants and roots from the woodlot, they still require additional food inputs, especially during the winter months. This can get expensive so the alternative is to generate the additional food for them on-farm in keeping with a more sustainable production model. The benefit happens to be tastier pork. I’ve researched nut trees to plant this year and have settled on hazelnuts. Obviously if I plant hazelnut trees, then they MUST be inoculated with tuber melanosporum, black truffle spores to make “black diamonds”. Can truffles be grown in TN? I guess the answer is yes, but it’s complicated. It looks a bit like marmalade. I see these petite spiced orange pickles as a smart garnish on all kinds of roasted or braised meat dishes. This recipe also makes wonderful syrup for vinaigrette’s and marinades. I even like the idea of putting a small slice in my tea for the aromatics of the cloves and cinnamon. I highly recommend The Joy of Pickling, there are all kinds of unusual recipes and unique ingredients, like pickled nasturtium pods which, according to the book make better capers than capers. My nasturtium seeds have already been ordered; can’t wait to try that one. 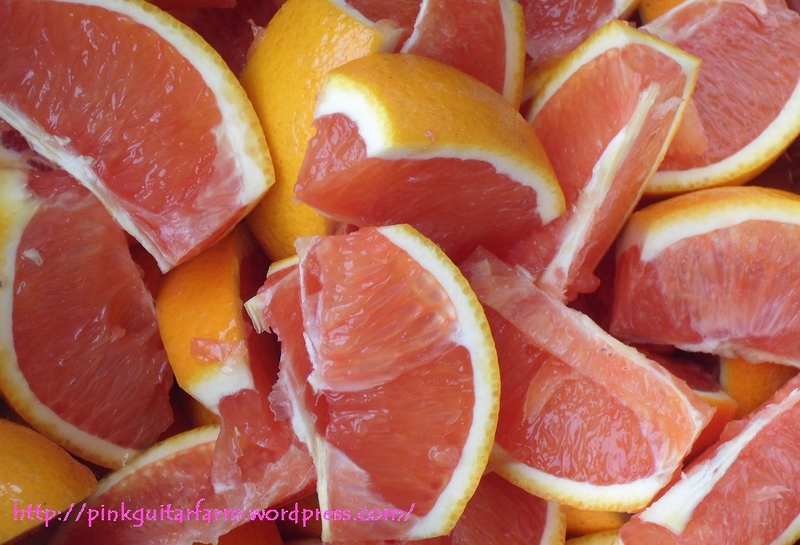 Next, I turned my attention to the grapefruit, which was not disappearing as quickly as those beautiful red navels. I was thinking Moroccan Lemons but with grapefruit. 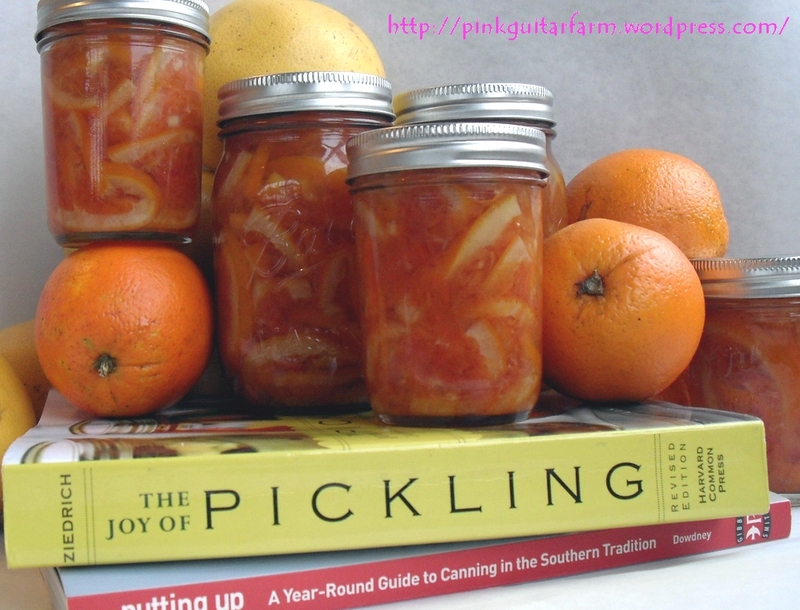 Funny how my Joy of Pickling book doesn’t have any recipes for pickling/preserving grapefruits at all. There might be a reason for this, I shall find out. 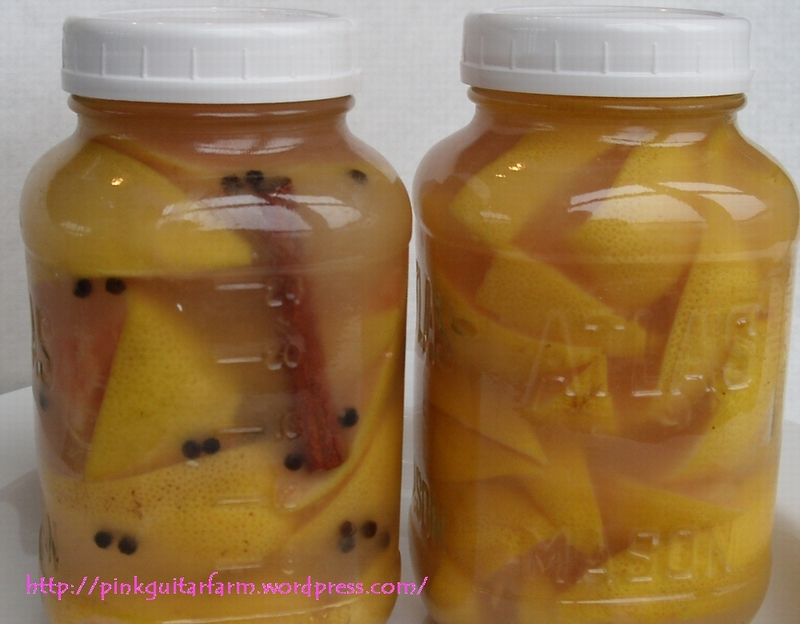 I forged forward using the recipe for the Moroccan Lemons, again, in The Joy of Pickling book, by Linda Ziedrich (pg. 156). 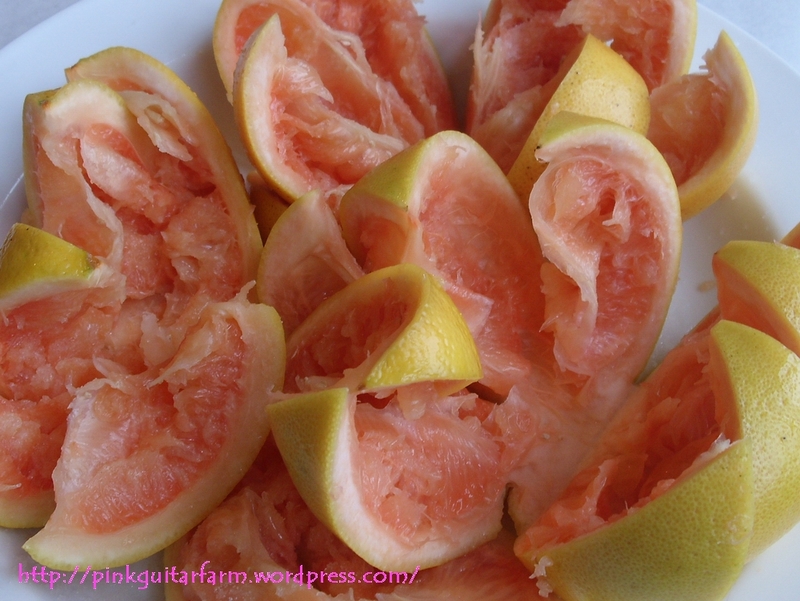 While I was preparing this very easy recipe, I thought about what goes with grapefruit. Crab, chicken, halibut, avocado, lemon thyme, parsley, cloves, cinnamon and why do I keep seeing a fresh red-orange papaya chopped up with the rinsed, preserved grapefruit, Italian parsley, red onion and fresh squeezed lime over Mahi Mahi? Must be hungry. I put the salted grapefruits in the jars with the salted fresh squeezed juice. I left one of the jars plain and in the other jar, I added cinnamon sticks and peppercorns. I used 2 grapefruits per jar and 2 more for the juice. I topped both off with olive oil and marked the calendar for 3 weeks, at which time they will go from my counter-top to the fridge. This is an experiment, if they taste awful I can always clean the bathtub with them. Or make bath salts. Preserving is fun, but still a little scary. How about a nice easy limoncello, but with grapefruit, this seems fairly foolproof ahem, well, something proof. I did a quick search for pompelmocello and THAT’S certainly not an original idea! It would make a SAweeet salty dog though! When I make mine I’ll post it. It will officially be called a “Salty Hog”.